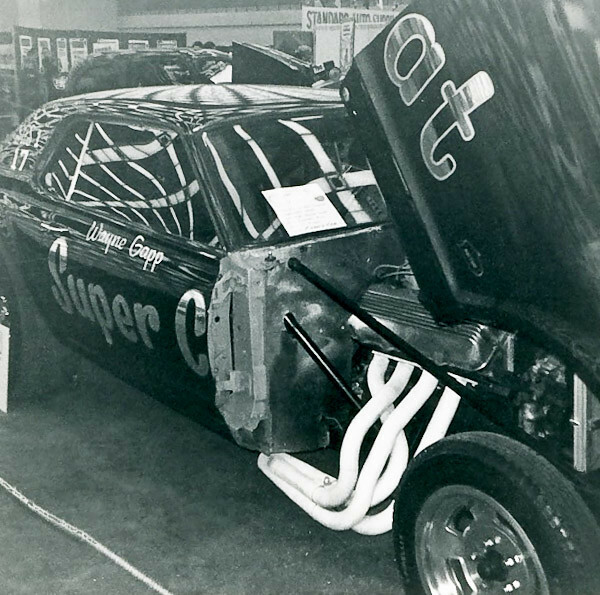 Although the fuel cars grabbed most of the headlines in ’68, the Super Cat was very successful. NASCAR was still sanctioning drag races in 1968, and Gapp walked off with the NASCAR Winternationals gas funny car crown. He won class or eliminator titles at several other events as well. In addition, Gapp and the Super Cat engaged in match racing with other gas funny cars. You can read more about the and find additional Super Cat photos on Gapp Online, Jeff Gapp’s web tribute to his father. According to FordMercuryCougarXR7.com the Cougar was eventually sold to John Skitmas, who continued to campaign the car under the Super Cat name. Gapp acquired Pete Gate’s old Comet flopper, equipped it with a fiberglass “68 Mustang shell and replaced the Cammer with an injected Boss 429 Ford running gasoline. Daryl Huffman now owns the body shell and has done a wonderful restoration of the Pete Gates “Gate Job” Comet using the original chassis. I have no word about the whereabouts of the Super Cat in 2012. This entry was posted in 1968 and tagged Autorama, Cougar, Detroit Autorama, Funny Car, NASCAR, Super Cat, Ultra-Stock, Wayne Gapp. Bookmark the permalink. Post a comment or leave a trackback: Trackback URL.